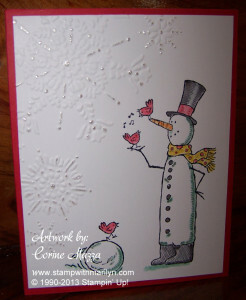 This cute snowman card was designed by Corine Mazza. What you can’t see on this card is the sparkle on the snowflakes. This handmade card is simply beautiful! This next card was designed by Michele Lacerda. 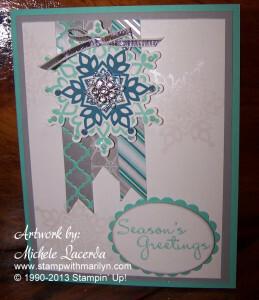 She used the Winter Frost designer paper and the Festive Flurry stamp set with the matching framelits! And what is a card without a little bling? 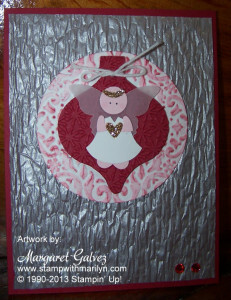 She added the Frosted Finishes embellishments to the center of the card and the narrow silver ribbon to the top! This last card was designed by Margaret Galvez. This precious angel was made with a few different punches from the SU collection. Te body is made up of the tab punch, with a circle for the head. The wings are a butterfly cut from vellum! So cute!! cards, handmade cards, Stampin' Up!. Bookmark.